Let me start of this review by stating that I had no need/want/desire to visit the restaurant I am about to review. I was fully content to never go and try it as, after review of their menu, nothing looked appealing to me. I spent most of my day on Friday planning on not going to try this restaurant. But then, at the last moment, I decided I should go so that I could at least write a review of it. 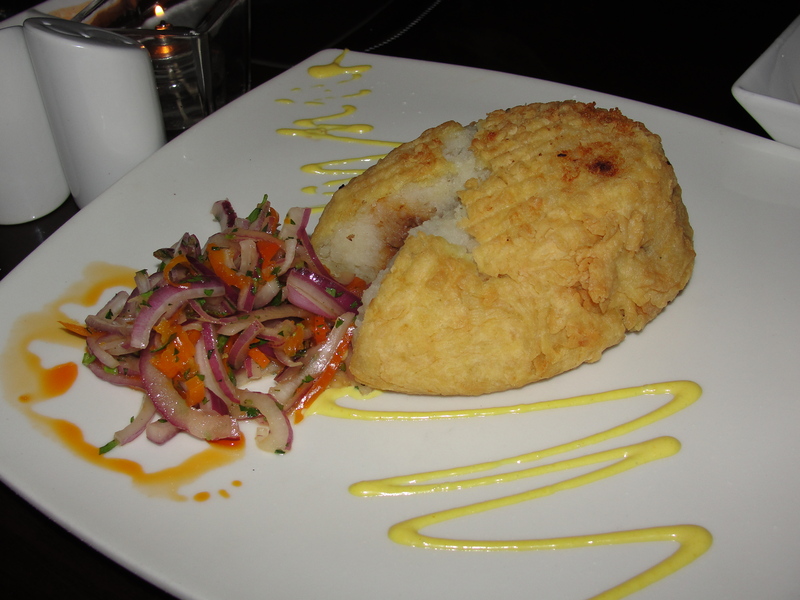 So, I went to Inca’s Kitchen in Naples last Friday night. I definitely should have stayed home. 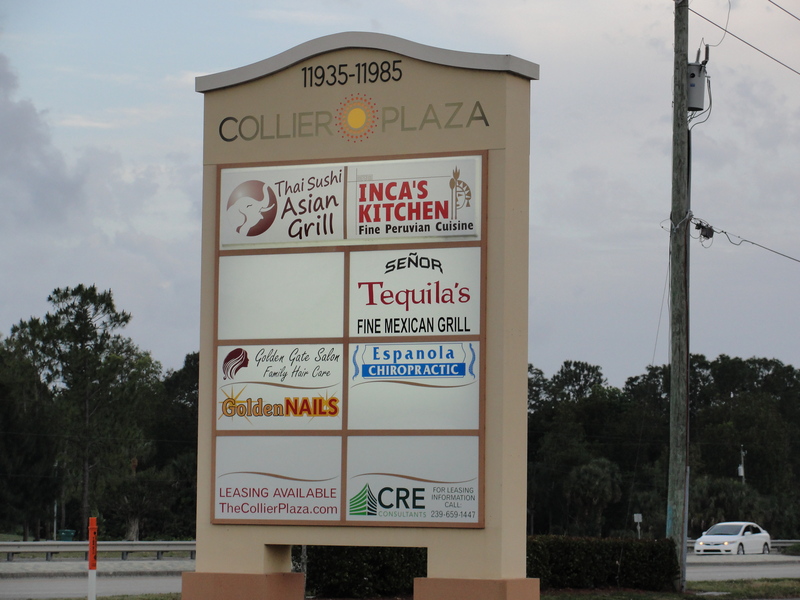 Inca’s Kitchen is a Peruvian Restaurant that opened in Naples a few years back. After becoming very popular, and increasingly busy, the owners purchased the building next to the restaurant so that they could expand. Mommy and I met Gino and his Mom there for dinner at 7:30pm. Gino called when they opened on Friday, and this was the earliest time they had available. We arrived right on time to a very full restaurant. The interior was quite lovely and we were seated right away. It was not fancy but rather casual and basic. After reviewing the menu many times over, there was absolutely nothing that I was interested in. As I mentioned, I was kinda expecting this. Most of the dishes involved meat, eggs or tilapia. There were only 2 chicken dishes on the menu – one which included eggs and the other which included fried rice. As I didn’t want either, and I don’t like tilapia, I settled on an order of rice and beans. Ohh joy. 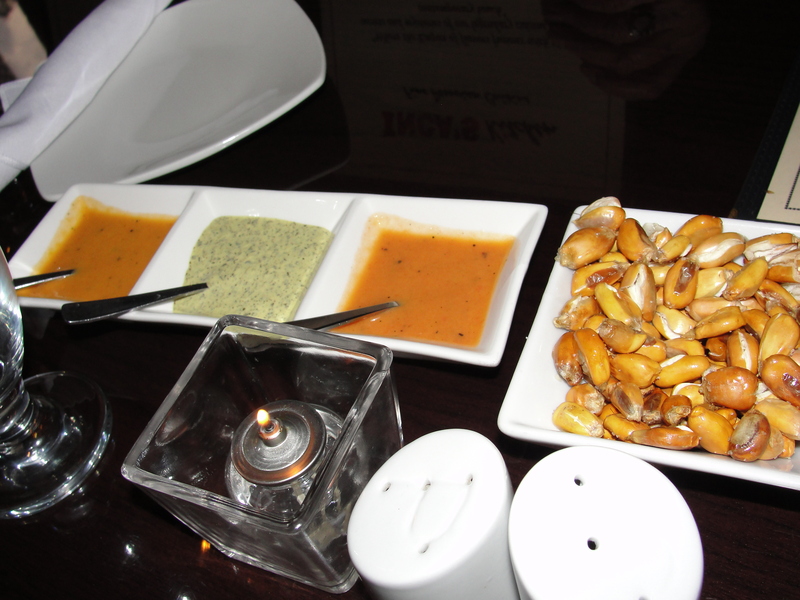 Our waitress brought out some corn nuts and 3 dipping sauces. The corn nuts tasted as if they had been warmed up on a skillet. I had a few but they left my mouth very dry and with a funny after taste. I did also try all 3 dipping sauces and found none of them to be very appealing. One of them had some spice to it, one was cheesy and the other was just kinda there. I didn’t care for any of the sauces with or without the corn nuts. I was already starting to feel really bummed out. Gino ordered a stuffed potato as an appetizer and I tried a piece of this. It was stuffed with a beef mixture, but the piece I tried, was only potato. It tasted like a twice baked potato and was actually pretty good. There was a mustard based sauce on the plate and when I paired it with the potato, it reminded me of potato croquettes. If there was an available stuffed potato that did not involve meat, I would have ordered it. Or if they offered just a potato alone. Alas, there was none so I waited for my rice and beans. Everyone’s food arrived however, I had to wait a few extras minutes before I received mine. I found this somewhat odd since I ordered two items that are considered sides and, I presume, are ready to go. Once I received my food, I realized I was probably going to be leaving hungry. You know how normally if you order a side item purely on the side, you receive more than you would if you ordered the item as your meals side? Well, this was not the case here at Inca’s Kitchen. I had an ice cream scoop size of white rice and a small bowl full of beans. There was also a very thin piece of fried potato with my beans. This tasted like a thin chip and was pretty good. Not much there but pretty good. I started with the rice and found it to be sticky and salty. It wasn’t bad but the saltiness of it made it not so great either. The few bites that I had that were not super salty, were pretty good. I liked the fact that it was sticky rice and, had I received more of the non-salty rice, I would have really liked it. 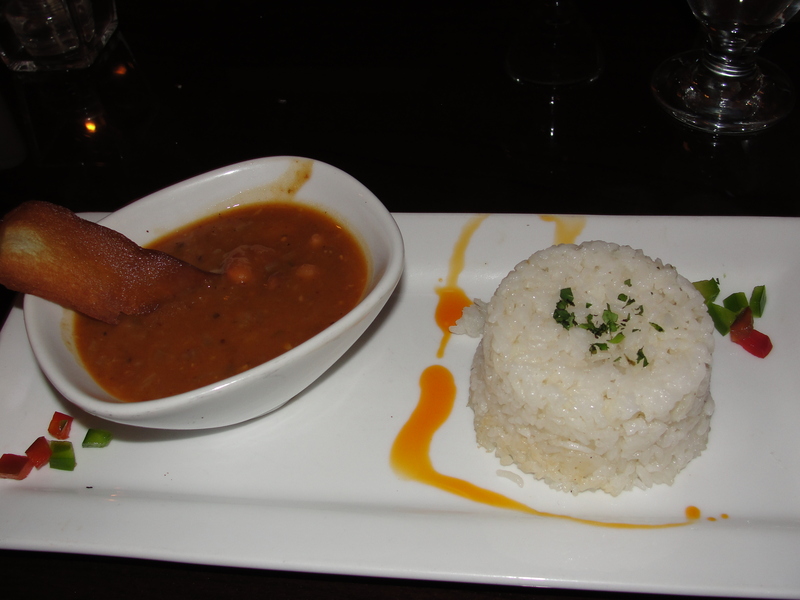 The beans were served in some kind of sauce that had flavors of salt and beef stock. The beans were white beans which are not my first choice. Since the beans were served in the sauce, they became extremely tender to the point of being mushy. Every bite I took didn’t even involve too much chewing – the beans kind of just fell apart in my mouth. My small bowl was full of much more sauce than beans. After finishing my rice and beans, I felt parched and unfulfilled. Mommy ordered the chimmichura steak which was served with a side of pesto pasta. I had quite a few bites of the pasta which I found to be overcooked and lacking traditional pesto flavor. 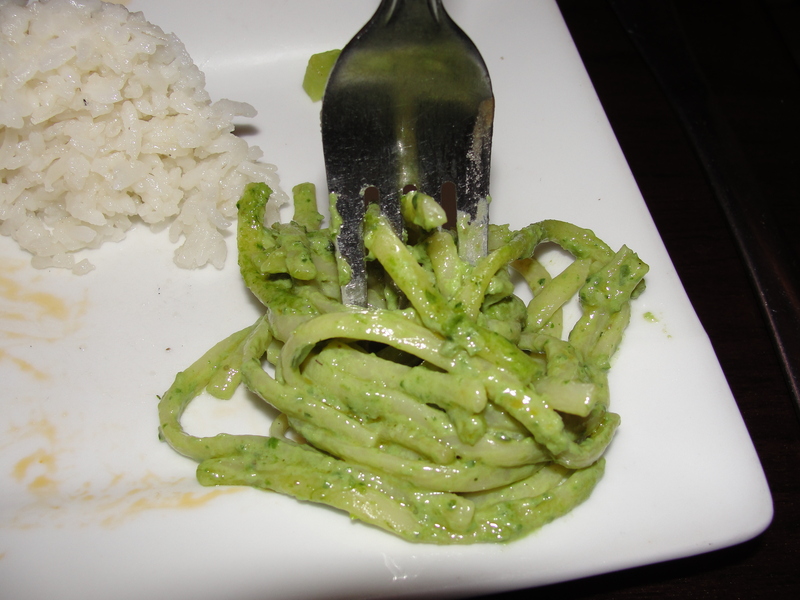 While the pasta was coated in the pesto sauce, I did not taste the normal garlic flavor associated with pesto. Rather, it was very mild and more along the lines of just oil and basil. The pasta was so beyond overcooked that you could easily cut into it with a fork. Bleh…I can’t stand overcooked pasta. For dessert, we opted for the Peruvian Bunuelos with chancasa syrup, anis and cinnamon. 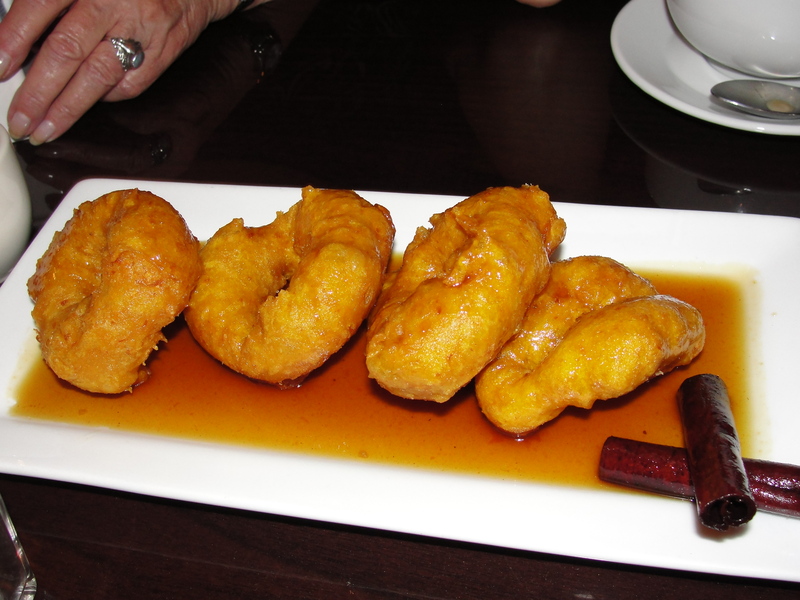 While they looked similar to other bunuelos I have had, they certainly did not taste like it. Bleh, these were so gross. 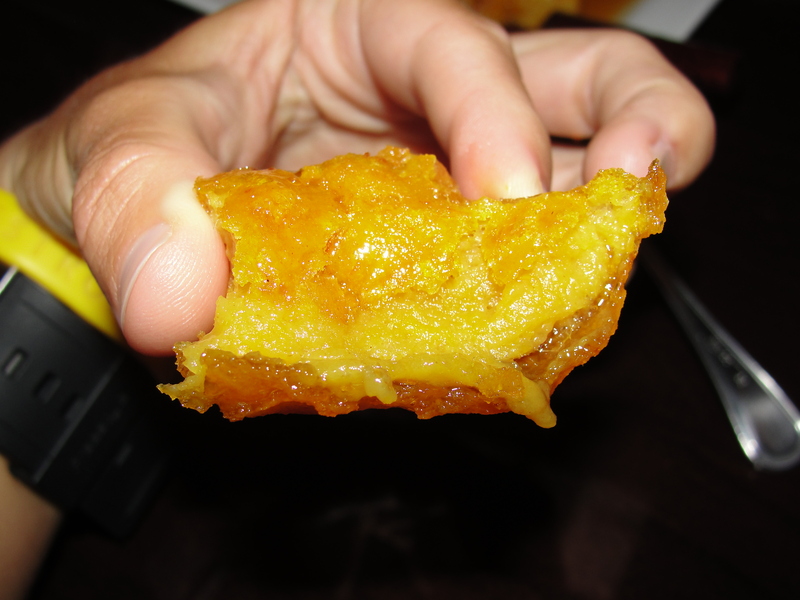 The outside consistency was perfectly and delectably fried but the inside had strange flavors of sweet potato. I love sweet potatoes but, in this instance, was totally disgusted by the flavors they created. Mix this in with the syrup, anis and cinnamon (all of which the plate was covered with) and the end product was so gross. I tried to eat an entire donut to really give it a chance, but the odd flavors just left my mouth feeling violated and disgusting. Inca’s Kitchen is obviously quite popular and tons of people find the food to be great. The service was good, the restaurant was clean and the prices were fair. Even with those key components, the main component of food was just not there for me. I did not like any of the meal and have no need to ever go back. There was obviously nothing on the menu that appealed to me and I would really like to simply never go again. Gino’s mom loves the place and Mommy enjoyed it as well. I mean no bad feelings towards the restaurant and wish them all the luck in the future. It simply just wasn’t for me. Looking back now, I should have just stuck with my gut. I Should Have Stayed Home.